This Richard Landry-designed breath-stealer that just came on the market at $29.95 million is a new construction located in the exclusive celebrity-filled Malibu Colony. Landry, listed by Architectural Digest as one of the world's top 100 architects, couldn't have had a more choice location to work with. The 6,000-square-foot home is situated at the end of a cul-de-sac on one of the best sandy sections of Colony Beach. The property has 65 feet of beachfront. There are five bedrooms and an office, and a detached guesthouse, plus a 1,200-square-foot rooftop entertainment deck with spa, bar, barbecue and 360-degree views. The famed Malibu Colony is, of course, about as tony an address you can have in Malibu, a pretty tony place to begin with. The Colony has long been home to celebrities, although in recent years you are more likely to find studio bigwigs like Brian Grazer living there (his house is on the market, as well) along with A-list celebrities who appear on-camera. Still, to see and be seen, this is where you want to be. The Colony fosters the image of exclusiveness, with 24-hour guarded gates at which car-trunk searches are routinely performed to ferret out cameras, lest you be a paparazzo trying to sneak in. It's also the scene of large beach parties in the summer, generally sponsored by corporations who rent out or own some properties. Damon Skelton of Coldwell Banker, Malibu Colony office, has the listing. 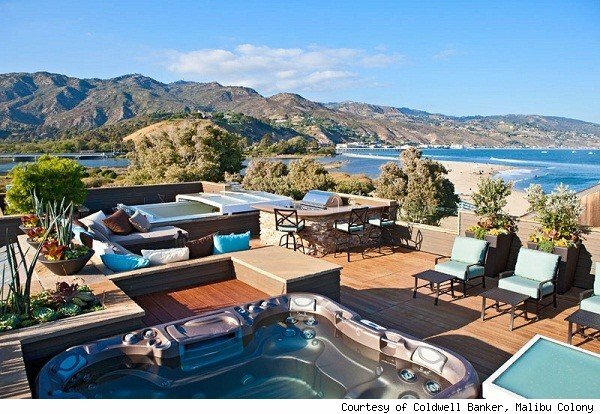 More homes for sale in Malibu, Calif., on AOL Real Estate. See more Houses of the Day and homes for sale in Jackson Hole, Wyo.,on AOL Real Estate.